A recently deceased man returns to his home to try to reconnect with his bereft wife. 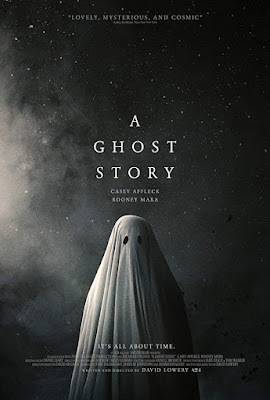 Some folks may be wondering why I've decided to review A Ghost Story on the blog. On IMDb, it's not listed as a horror movie. Some people would even consider this to be the furthermost thing from a horror film. Earlier this year, we had a movie called Personal Shopper. A supernatural drama that deals with a medium trying to contact her deceased brother. Like that movie, A Ghost Story feels very similar to that story in both tone and visual aesthetic. If anyone goes into A Ghost Story anticipating some violent or intense supernatural horror film. They will be sorely disappointed with the outcome. The film feels like a meditation on love, loss, grief, and death. You won't find any vengeful ghosts here. While the main character in the story is a sheeted ghost walking the Earth. It's not exactly spooky. It's very odd to watch this story that deals with such heavy themes but has a man wearing what some would consider the traditional Halloween ghost costume as a get-up. What I loved about A Ghost Story was its examination of life and death. This is a devastating film. The entire thing felt very poignant. Almost immediately we lose our husband character in a car accident right outside of their own house, and we watch as his wife tries to come to terms with his passing. It's from the very first moment that this movie begins, there is this sense of sadness looming over this entire thing. The whole thing feels incredibly sombre. Another element that I think worked beautifully is how it handles the passing of time. This movie plays with time in a way that makes us feel like we are right there as our main character watches everyone around him move on after his death. It really hits you hard emotionally. It's one of the most heartbreaking aspects of this story. To be in love, then pass away, and watch as that love moves on or moves out of the home you shared and you are now destined to spend your existence in this place. It really felt profound. I don't think I've seen death handled this way. We now come to the performances. I don't think I can really rate the performance of Casey Affleck as he spends the entire film under a white sheet and he never speaks. This is Rooney Mara's show. I think she was absolutely fantastic in this film. There is this moment where the camera lingers on her as she sits and eats pie on the kitchen floor after he husbands passing. It's a simple scene but so compelling. It really hit me hard. As someone who has never really felt the loss of a partner, parent, or sibling. I don't know that grief. But I think this movie captures that feeling of loss. Visually, I think the movie is beautiful. Early on, the film is quite neutrally toned. It has a lot of greys, whites, and blacks. As he starts to spend his time wandering the Earth. We begin to see the film open up. A scene where he stands in the rubble that was once his home and is now demolished and all you see is his ghost standing in a field. It just looked so haunting. There is also a moment where his spirit stands on a rooftop while overlooking a futuristic city which provides the film it's most colour. I really loved the look of this movie. My biggest issue with A Ghost Story is that at times, I felt like it may have dragged a little. The movie is very slow-paced. A lot of the film is shot in a way where we linger on characters for extended periods of time. We have the camera just stay on certain people for minutes at a time and a lot of it while necessary to the visuals. It felt like some moments just drag during those scenes where we navigate away from our two central characters. A scene involving Kesha at a house party is a pleasant surprise, it may have gone on a little too long. It may have taken me out of it as well. Lastly, I wanted to talk about the suspense. I mentioned earlier in my review that if anyone goes into this one expecting some intense or violent ghost story. People will probably leave this movie unimpressed and disappointed. I just wanted to bring up that there are scenes within the film where Casey Affleck's ghost does try to scare families out of his home by knocking books off the shelves or throwing plates that actually play quite creepy. There is no jump scares here, but the tension does ramp up during one or two of these scenes during the film. - A man is shown covered by a blanket in the morgue. - The skeletal remains are found with a spear in its back. - We see a body decay in the grass. There is no blood or violence in this film. A Ghost Story is a movie that hit me pretty hard on an emotional level. While this is not violent or incredibly scary. Some wouldn't even call this a horror movie as it feels like an existential drama. This felt like a beautiful meditation on life, love, loss, grief, and death. This is a story that genuinely moved me. The performances, as well as the visual aesthetic, are standout. While some of these scenes drag during the long takes, it's not enough to ruin how profound this movie felt after watching it. I highly suggest that people give this one a watch. This movie was incredibly profound. The performances were excellent. I love that you mention time. It really does feel like a generational spanning film done on a very low budget. Excellent review. Thank you for reading my review. I agree on the spanning of generations. A lot can be accomplished on small budgets if you have great ideas.